And a few days' work with paint fumes. We gave him away to one of the winners of the five minihunts we ran that weekend. The prizes for those were steampunk Munnies (one of which you can sort of see poking out from behind the Dunny's box in the first photo). Those five teams competed to solve the last puzzle for the big guy here. And a $2k ruby which came with him... but really, the dunny's so much cooler. ; p My favorite part is the little switch on his chin actually makes a satisfying CLUNK sound when you flip it... though I didn't have enough prep time to figure out the wiring and powering of the ear-light this time. That is for... THE FUTURE! Copyright 2007 The Ambrose Estate, Inc & Evan M Jensen. I thought this was a bong at first, but now, I have no idea what the hell this thing is. Thanks! I could make you one in similar fashion, but this one was a prize at a convention treasure hunt. Well, if you still desire a custom Dunny in the summer, let me know! this is really awesome and creative! You should try and submit it for recreation on their series! IF U MAKE ANOTHER ID BE COMPLETELY WILLING TO BYE IT FROM YOU FOR A REASONABLE PRICE.MAYBE $30? MY FOOD! This is very amazing! I'm not to fond of the dunny shape but i'm in love with the way you made yours! Unfortunately, he was a contest prize for something in 2006... no idea where it is now! Ahhh man. What car parts did you use? Um, no idea... some parts of the undercarriage and the engine, I guess. This is very creative. I like your back story. But I don't own it anymore! o...m...g...this is by far my favorite dunny. ever. out of all the customs i have seen and the KR originals. brilliant! Thank you much! I'm really glad you dig it. dude what did you use to glue it? its so effin nice!! hands down! Um... not sure anymore. Gorilla glue or Elmers' equivalent I think. 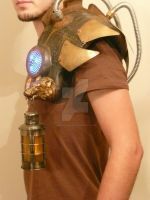 Steampunk is such an amazing thing to behold with all the inventions. The mind may boggle, but the imagination will win the day! Be we do! And your welcome deary. This is such a great Dunny! Definitely oozes 'steampunk'. Just when I thought my life couldn't be made anymore complete...I find this. Wow. You are my hero. this is amazing work, im am deeply impressed by it. Wow, that device is just absolutely adorable! If I had any money I would try and buy it from you, but alas I'm poor and aside you might have already sold the cute little devil.